I feel like I have so many posts I want to write but finding any spare time as the moment is a tough. I'm actually off to Miami tomorrow (for Labor Day Weekend) + I'm hoping I will have enough time to do a couple posts there. Fingers crossed. Now, onto this post. Whenever I get samples that come in sachets I always manage to forget about them + they just sit in my sample jar for the longest period time. However, when samples come as minis of the actual product itself I am way more likely to use them. These are three mini products that I have been using everyday for the last week or so. The first is the Origins GinZing Eye Cream, which I have been using every morning because it's extremely lightweight so it works well under concealer. I have actually liked everything I have ever tried from the brand so it doesn't really come as a surprise that I like this. It's a lightweight, pink, shimmery cream (sounds weird, I know) + it really brightens up the undereye area. I tend to apply a richer eye cream before I go to bed (at the moment it's the Kiehl's Creamy Eye Treatment) so I don't need anything too heavy during the day. I do actually like to use a tiny amount of this over my concealer too + just gently dab it on for even more brightness. This is a generously sized sample so although I won't be finishing this anytime soon I am already thinking this will have to be a purchase. However, if you're only going to have one eye cream I would definitely pick something more moisturising. Next is the Benefit Watt's Up highlighter that I briefly thouched on in my last post. I never had any interest in trying this out for some reason but it's actually pretty perfect. This really is the perfect champagne toned highlighter. I love a cream highlighter for ease of application + because it blends in with the skin better + I also don't find this one to be overly shimmery. Again, this is a decent sized sample so I probably won't finish it too quickly but I'm thinking after I use this + my old Jemma Kidd highlighter up then this will be on my shopping list. The last sample is an exciting one for me because I have nearly picked up the travel size of this on so many occasions (aka everytime I'm at Sephora). I'm talking about the pricey Hourglass Mineral Veil Primer, which I have unfortunately fallen in love with. I'm definitely a bit of a primer lover so I should've seen this coming. All I'm going to say is that it doesn't feel too siliconey, slippy or thick + it just makes you skin look + feel amazing. If you can get a sample of this, do it. I have benefit watts up highlighter in full size after trying the mini size and its so amazing, one of my fave cream highlighters! The Origins eye cream sounds lovely! mini sized things are so cute! I'm totally in the same boat, sample sachets are just too much of a hassle to use, whereas deluxe sized minis are so cute and convenient haha! 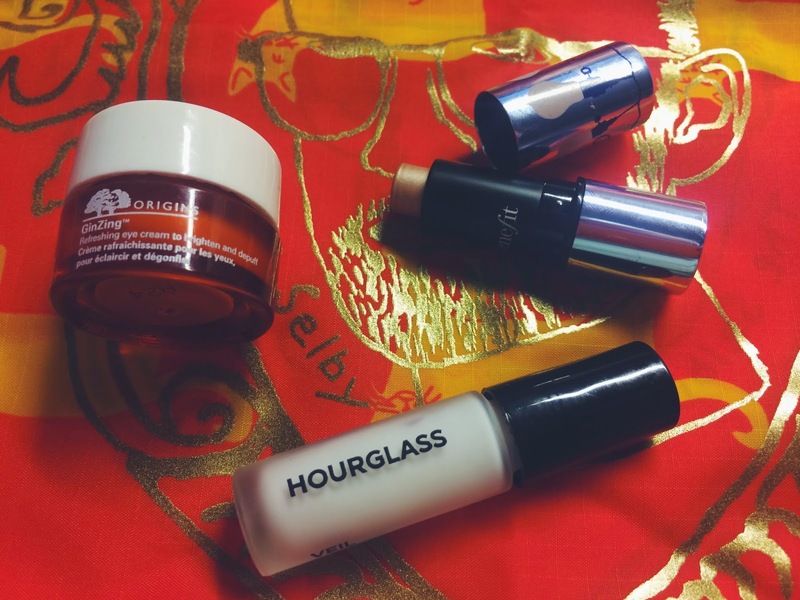 I've heard so much about the Hourglass primer, I really want to try it so hopefully I can get my hands on a sample too!